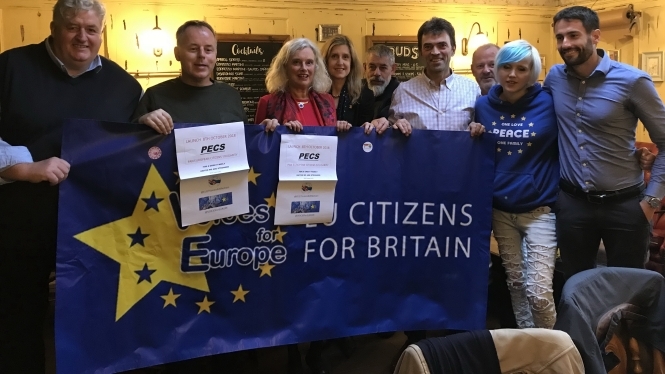 French barrister Julien Fouchet has launched a movement called Pan European Citizens Solidarity (PECS) calling on all EU citizens, including Britons “to rise against Brexit”. Attendees at the London launch meeting included academics and UK and European politicians. Mr Fouchet said: “Now is the time to act, before it is too late. It is our duty as European citizens to protect our British friends, our brothers and sisters who want to remain in the EU family. He said the launch was held at a venue near Queen Mary University of London, shortly before a conference at the university on EU reform. Among those at the launch were Tom Brake MP (Lib Dem), Julie Ward (MEP), chairwoman of the Voices for Europe campaign Prof Emmy van Deuzen, German communications expert Werner Trapmann and British campaigner ‘EU Supergirl’ Madeleina Kay. At the moment the movement is in its early stages and people can support PECS on Twitter at Mr Fouchet's page EU27Voices4remainUK (Twitter handle @EU27k) and at Voices for Europe and there is a fundraiser here. The movement hopes to gather representatives from every one of the 28 EU States and plans to hold a meeting of the representatives, probably in the South of France, as soon as practicable. Mr Fouchet said they would be seeking support from European Parliament Brexit coordinator Guy Verhofstad “who defends the idea of a pan-European initiative”. “We hope to obtain his official support so as to help mobilise all the heads of government and the Opposition and Majority politicians in the 27 other EU states. “For the moment the British feel isolated and not sufficiently supported by the rest. However at the launch we weren’t just British people, there were people from countries including Germany and the Netherlands and myself from France. “My wish is to mobilise as many Europeans as possible to offer a different outcome for the UK and support them in the idea of another referendum. “My own legal actions are aiming to stop Brexit, but if that doesn’t work another referendum could be the answer." Mr Fouchet is leading a legal action on behalf of Britons in the EU, including rights campaigner Harry Shindler, 97, arguing that the Brexit negotiations are illegal because of the exclusion of many of long-term expatriates from the referendum vote which set the Brexit process in motion. He is still awaiting a decision from the EU’s General Court. He has now launched a new legal challenge to Brexit based on the fact that a Briton in a French commune in the Lot-et-Garonne has been excluded from registering to vote in EU elections next year. “The reason given was uncertainty because in theory the UK is leaving the EU and EU citizenship is required to vote in EU elections. However there is a legal uncertainty as to whether the key moment is when you register or when you vote,” he said. He is also arguing that if there is a transition period extending Britons’ rights to the end of 2020 then the UK should retain MEPs until then so Britons can vote for them. “I would like the European judges to give a view on that. “If it works I will have a second chance to cancel Brexit in front of the judges,” he said. – PECS argues that the referendum was legally-speaking of an advisory nature and the UK Parliament never explicitly voted to leave on its own sovereign authority. The November edition of The Connexion newspaper, out next week, has two pages of Brexit news.